I want those notes and reblogs. 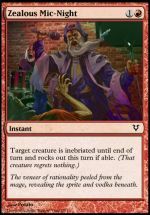 It’s no surprise that Hasbro’s recent publishing deal with General Mills had a big effect on the top-down design of Innistrad. 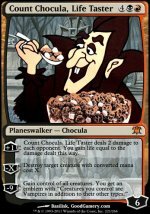 In week two of the Innistrad previews, Mark Rosewater talks about the influence that the five monster cereal tribes had on the set’s development. Read ahead for an exclusive look into some Planeswalkers that were cut late from this set’s development! Dominion: Cornucopia is the latest food-themed expansion for Donald X. Vaccarino’s award-winning card game, Dominion. It consists of 13 new kingdom cards and 5 unique Prize cards, which you can win in the food-themed tournaments. What is Batterskull? Let me show you! Fire up your ironworks, put some meat on a stick, open a bottle of venomous ichor (as cold as the ice age), and wave those banners around.